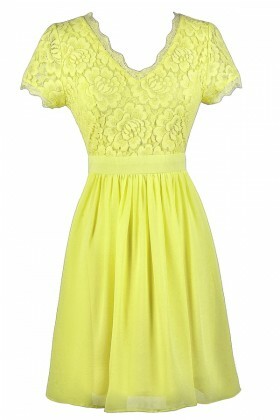 Brighten up in these gorgeous yellow dresses! 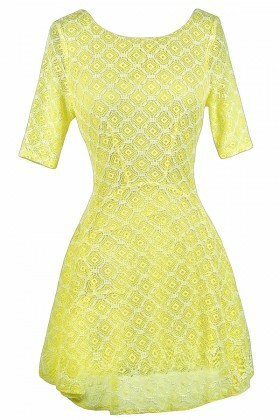 Yellow is the perfect cheerful addition to your wardrobe. Choose from pale pastel yellow dresses that are perfect for Spring, or go for a bright lemon yellow dress during those hot Summer months! 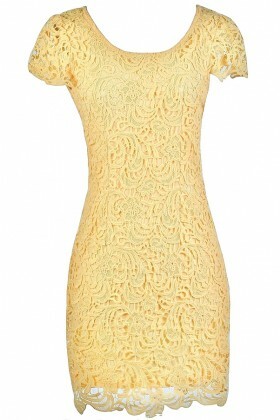 Yellow and lace are two things that go together effortlessly. A flirty yellow lace dress can be sweet and chic at the same time, and you can never go wrong with a classic flattering A-line cut. Yellow may seem like a difficult color to find the right shoes and accessories for, but a classic pair of neutral beige pumps or wedges can effortlessly complete the look. Or if you're going for something a little more bold, try pairing a yellow party or cocktail dress with bright contrasting accessories. What if you're planning a Spring or Summer wedding? Consider a yellow dress for your bridesmaids! Yellow may seem unexpected, but it's the perfect way to add some sunshine to your wedding day. Don't be afraid to be bright and bold in yellow- and get FREE shipping on orders over $75 within the USA.